U.S. News & World Report has consistently found itself ranked third in circulation of newsmagazines, a standing which translates itself into the world of collectibles as well. After all, if TIME has survived most of its history as the most popular of newsmagazines, and Newsweek has always played second fiddle, why would U.S. News & World Report be any more popular among us hunting back issues today? If you’re only collecting TIME for its often beautiful cover illustrations or cover photographs of the famous from years past, then perhaps U.S. News & World Report is not for you. But if you’re opening the issues up and reading them or compiling your research through the pages inside of TIME, then you may want to pay better attention when a batch of old U.S. News & World Report issues crops up at a garage sale or from an online seller. The covers on the vintage issues that I have handled have matched older issues of Newsweek insofar as appearance. The main difference between older issues of the three, and sometimes four (more on that to follow), magazines is that U.S. News & World Report was primarily political and did not delve into the worlds of sport, film and other popular culture that TIME and Newsweek did in each issue. In other words, I want to save that issue of TIME because it had a really interesting article about (fill in the blank: Bob Hope, the Gas House Gang, biography of Patton, etc. ), while I’m going to junk this issue of U.S. News & World Report because it’s just filled with news that is going to be obsolete by the next issue. While you can say this is the fault of the magazine itself, at the same time you have to remember this is part of how U.S. News & World Report distinguished itself from both TIME and Newsweek. To a degree it damned itself to posterity because it was less like the better-selling twin sisters atop the newsmagazine pack. While not the revolutionary invention that TIME was to the world of magazines when it debuted, U.S. News & World Report does have a very interesting history in that it is actually the result of a merge between two separate magazines published by the same man, a syndicated columnist by the name of David Lawrence. David Lawrence was a reporter himself, working as an Associated Press (AP) Correspondent while attending Princeton. A conservative columnist, the Eleanor Roosevelt National Historic Site, a space dedicated to someone whom I would figure as Lawrence’s personal opposition during their own lifetimes, heaps praise upon reporter and publisher Lawrence, noting that he quickly gained praise “for the maturity and detachment with which he wrote.” This same site was the best source of biography I ran across for Lawrence, detailing his early career and employment jumps. In 1913 Lawrence became a White House correspondent in Washington and in 1914 he helped found the White House Correspondent’s Association. Lawrence would become a trusted voice to President Woodrow Wilson, who would often seek out the reporter’s opinion over U.S. and Mexico relations, one of Lawrence’s areas of specialty. Lawrence kept busy, leaving the AP in 1915 to work for the New York Evening Post where he would stay through the end of the war in 1919. David Lawrence founded his own United States Daily newspaper in 1926. The United States Daily published text of laws, regulations and court decisions coming out of Washington. The Daily would not grow large enough to support advertising, but it was the immediate precursor to the United States News, which debuted as a 16-page newspaper May 17, 1933. 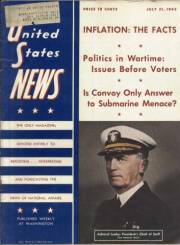 United States News would switch from newspaper to magazine format beginning with the January 5, 1940 issue. This publication represents the U.S. News in U.S. News & World Report. I bet you already know where the other part of the name comes from! But, if not, United States News was successful enough for Lawrence to introduce a complementary publication titled World Report. 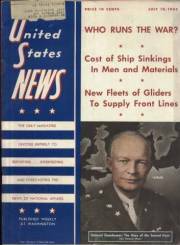 The first issue of World Report was dated May 23, 1946, but the new magazine merged with United States News less than two years later creating a new publication titled U.S. News & World Report. World Report itself, with circulation of over 135,000, had not failed so much to attract a readership, it had however failed to attract advertisers. The first issue boasting the new title was dated January 16, 1948, and it, of course, survives to this day. 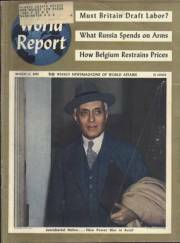 I have/have had a good portion of the World Report run from 1947, but unfortunately at the time of this writing only have a handful of United States News issues that all date to World War II. That makes the kind of comparison that I’d like to conduct impossible at this time, however I still figured we could get a general idea of the similarities and differences of the two titles from having a look through an issue of each…even if they were dated five years apart. Obviously, the titles tell you the main difference. But in case you popped by a newsstand in the 40’s and were a little dense, underneath each bold title is a brief description in much smaller type. United States News declared itself “The Only Magazine Devoted Entirely to Reporting … Interpreting and Forecasting the News of National Affairs,” while World Report prided itself as “The Weekly Newsmagazine of World Affairs.” The issue of United States News that I paged through was dated July 24, 1942, and so did contain some reportage beyond United States borders, but even with World War II in full bloom it did manage to focus on war-related topics from a national view and devoted quite a bit of space to labor issues as well. Cover price in 1942 was ten cents. In the future, I’d like to include a brief run-down in this space detailing the contents and columns of an early issue of the merged U.S. News & World Report. At this time, this title is out of stock. Personally though, I do find the earlier, separate titles more interesting in that they represent the necessary steps to a publication that is still with us today. What happened after the merge? Circulation of U.S. News & World Report would top one million by 1958, two million in 1973. David Lawrence, 1888-1973, sold U.S. News & World Report to a group of employees in 1962, who held onto the title until its purchase by New York Daily News publisher Mortimer B. Zuckerman in 1984. Just prior to Zuckerman’s purchase, U.S. News & World Report would issue its first annual rankings of American colleges and universities in 1983, a popular specialty which expanded over the years and led to other special ranking issues which are perhaps the most notable features of U.S. News & World Report today.